Cortisone is a therapeutic drug used to fight ailments ranging from asthma to arthritis. It was the athlete's best friend throughout the 20th century. But in orthopedics, there is a significant downside. Cortisone is naturally produced by the adrenal gland in the body and influences the functioning of most of the body's systems . Since the discovery of its antirheumatic properties in 1948  and its synthetic commercial production soon after, the drug has been injected into every swollen joint, every inflamed tendon, sore back, and aching body. The anti-inflammatory nature of the drug soothed the pain and reduced the swelling, yet permitted the athlete to further injure themselves time and time again. We now know that a cortisone injection interferes with the body's natural healing process, which works like this: When tissues are overused, overstretched or torn, the cells of those tissues release factors that recruit blood vessels, stem cells and healing factors. With that in rush of fluid, the tissue temporarily swells. Over time, with the laying down of new collagen, the protein that makes up most of our body, the injured tissue heals. Some tissues heal normally others with scar tissue that over time often can remodel into normal tissue. Cortisone shuts down this cellular recruitment process, reducing swelling, but unfortunately inhibiting healing . The result is that the weakened tissues stay in the weakened state for a longer period of time, sometimes exposing the athlete to repeat injury or permanent damage. This panacea drug has always had this hidden harmful risk. If used too often or in the wrong place such as the Achilles tendon, the tissues can completely rupture and never return to the full, uninjured state . Tendonitis is a great example. It often starts at the elbow, for example, after a hard golf or tennis shot, and becomes chronically sore due to micro tears in the tissue that fail to heal. The tissue over time becomes chronically degenerative and sore. Cortisone sometimes helps but does nothing to repair the injury and often weakens it further . Fortunately the cortisone era is over. We have realized that the best response to tissue injury is to stimulate stronger healing, to feed the cells that are trying to repair the injury, and to recruit more progenitor or stem cells to guide the complex healing process [6,7]. This tissue stimulation is done by a combination of careful early tissue mobilization, often performed by expert physical therapists, by early joint and tissue controlled exercises that stimulate repair rather than irritate the injury, and by direct application of growth factors and sometimes stem cells. Since we now understand the injury healing cycle well enough, and have the tools to boost the system, we almost always use stimulation factors first and hopefully relegate shutting down the body's natural healing process to the 20th century. 1. Nussey, Stephen S., and Saffron A. Whitehead. Endocrinology: an integrated approach. CRC Press, 2013. Chapter 4, The Adrenal gland. 2. Boland, E. W. (1950). THE EFFECTS OF CORTISONE AND ADRENOCORTICOTROPIC HORMONE (ACTH) ON CERTAIN RHEUMATIC DISEASES. California Medicine, 72(6), 405-414. 3. Hübner, G., Brauchle, M., Smola, H., Madlener, M., Fässler, R., & Werner, S. (1996). Differential regulation of pro-inflammatory cytokines during wound healing in normal and glucocorticoid-treated mice. Cytokine, 8(7), 548-556. 4. Mahler, F., & Fritschy, D. (1992). Partial and complete ruptures of the Achilles tendon and local corticosteroid injections. British journal of sports medicine,26(1), 7. 5. Ehrlich, H. P., & Hunt, T. K. (1968). Effects of cortisone and vitamin A on wound healing. Annals of Surgery, 167(3), 324-328. 6. Lopez-Vidriero, E., Goulding, K. A., Simon, D. A., Sanchez, M., & Johnson, D. H. (2010). The use of platelet-rich plasma in arthroscopy and sports medicine: optimizing the healing environment. Arthroscopy: The Journal of Arthroscopic & Related Surgery, 26(2), 269-278. 7. Falanga, V., Iwamoto, S., Chartier, M., Yufit, T., Butmarc, J., Kouttab, N., ... & Carson, P. (2007). Autologous bone marrow-derived cultured mesenchymal stem cells delivered in a fibrin spray accelerate healing in murine and human cutaneous wounds. Tissue engineering, 13(6), 1299-1312. 8. Wang, C. T., Lin, J., Chang, C. J., Lin, Y. T., & Hou, S. M. (2004). Therapeutic effects of hyaluronic acid on osteoarthritis of the knee. The Journal of Bone & Joint Surgery, 86(3), 538-545. 9. Namiki, O., Toyoshima, H., & Morisaki, N. (1982). 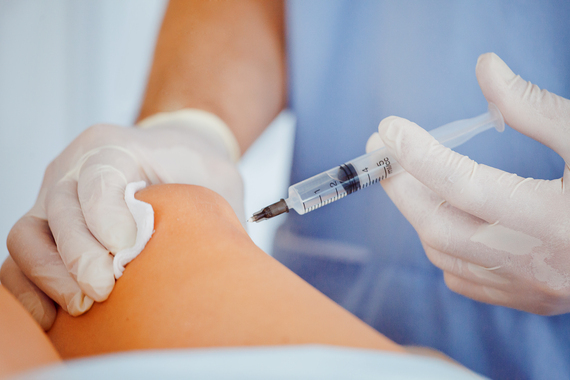 Therapeutic effect of intra-articular injection of high molecular weight hyaluronic acid on osteoarthritis of the knee. International journal of clinical pharmacology, therapy, and toxicology,20(11), 501-507.